Cyanotype is one of the earliest forms of photographic process, distinctive for its Prussian blue monochrome prints. It dates back to the mid-1800s and was later used as a simple and low-cost way for engineers to create copies of their drawing plans, hence the origin of the term ‘blueprint’. The process involves making contact prints with light-sensitive paper, either using photographic negatives, or photograms of objects and other materials. The process is easy to learn, ideal for experimentation, and can be done at home using daylight. Find out more about the workshop here. Over the past 3 months, our Artist in Resident, Sam Nias, has been developing a series of Screenprints inspired by the visual technical glitches and malfunctions that we see in todays new technologies. Come and join us in the studio to see an exhibition of Sams’ new Screenprints and hear what he has to say about his project. 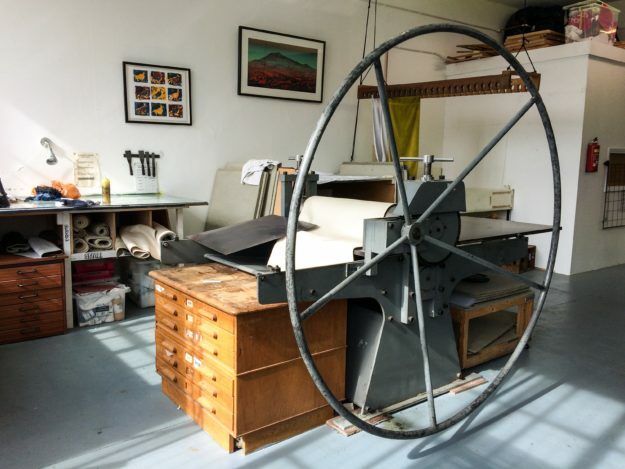 On Thursday 23rd June, East London Printmakers will be opening up its doors to the public, along with the rest of [space], for our bi-annual Artist Open Studio event. Back by popular demand is our Proof Print Sale where you can grab your self a bargain priced print at only £15 a pop. As well as that, we are also hosting Independent Artist Stalls featuring lots of hand made goodies from cushion covers to gift cards. We will also be selling our 2016 Box Set Prints, along side a Tombola raffle of all our past Box Set Prints. You’ll also have the opportunity to witness a variety of printmaking demos, scheduled throughout the evening. So, come and join us for printmaking shinanigans and a bottle of Pale Ale, kindly provided by the wonderfully delicious Five Points Brewing Company. Amrita, a printmaker from Calcutta, India, and our current resident Project Keyholder, is going to present her work on reflective self-portraits, and her experiments with ‘cracking’ effects for etchings which she has been working on while at ELP. She has explored the relationship between the ‘self’ and space, and how space can trigger self-reflection and new ways of looking at oneself. Amrita has trained closely under a master printmaker in Calcutta for 2 years. Her recent work largely deals with memories, and associations with private spaces such as bedrooms. The exhibition will include a display of linocuts and etchings, amongst other media.